Really… some guys know how to conquer a lady’s heart! This afternoon we come home from the seaside! After all our traveling, this lady gets home and … is as surprised as she can be! Really, really, really!!! Dad came in when he emptied the mailbox and said: Well, now we can see who is the most famous in this house! I did not even listen. Mostly it is my mum who gets the packages and the mail, for her library, you know! And international! The whole world will know I have this famous Australian cook, Chef Maurice as a very good friend! My dogness, I’m so proud! Mum, listen, it is time for a very big fototoot! Is the blinking thing ready? And no, mum, there are not too many, put them all there! I can’t choose. We only have two bloopers! One is my fault, the other is yours! Mum, get serious, this must be a good fototoot! Can you see the bandana very well???? I ame one of a proud lady! I’m really happy about this!!! You can tell I’m proud, mum? Blooper 2: mum makes bizar pics!!! Blooper 1: my fault, I moved! And now whe show it to everyone outside! Look, people, what I got from this great and handsome fellow! This gets me a bit shy… oooh, Maurice, how beautiful! On the way home, we met Pepper. Six months old Pepper. I often play with him in my little dogpark. Then Filou is there too. That’s for next time! When we came home, I saw this amazing and odd situation: a ship on wheels, a ship that was not in the water! My dogness! Reportage! Lady Kita meets… the Belgian King and Queen! At noon, we went out for our walk. Mum said we were going to make a bit of a special walk! There are these festivities this weekend in remembrance of 100 years ago: the first big war: World War I. First you have to know that in Antwerp there is NO bridge over the river Scheldt. There only are tunnels under the river: an old and small one, we call the rabbitpipe, a newer one for the highway, one for the metro and one for pedestrians only. This weekend we are celebrating that, as far as you can celebrate a war… 😦 The Belgian and Dutch army worked together and they install a pontoon bridge on the river Scheldt. If you bought a ticket in time you can cross it on saturday and sunday… All week long we could follow preperations because we live nearby on the left bank. They were making the bridge when we arrived, so mum did make a lot of pics! Then a lady was talking to us, telling us she had an airedale too, and she was petting me. Then she told that when the bridge would be ready, the king and queen woul cross the Scheldt and come to the left bank. Already, at noon! It was said to happen this evening. Mum always says that presidents and kings and queens are people like me and you, I mean jsut like you and mum and dad. She said she would proove that to me and make a pic of me with the king. We heard all the police-man and soldiers who were inspecting where he was going to walk. So the nice lady, me and mum… we looked for a good place! Yes, she is right my mum! She really is! My dogness!!! King passed, shaked mum’s hand, the king talked to me and he said I am a very beautiful dog! He said: “Mooie hond”, everybody could hear that!!! And then mum said: Kita, we take a pic of you with the king and we did pose for the fototoot, me and the king! But a very quick one, so pics are not that super! Little one! The king and you, not you and the king!! Impolite dog! Yes, grandpa: me and the king, you say it!! He’s a nice guy! He is like you and mum and everyone. But of course he had to go on! Later we also saw the queen. 🙂 We did not talk to her, but we have a pic! Traveling by metro… advice for city-airegirl Islay: part 1. Becomig a city-aire-lady is not as easy as you might think! You have to learn and experience a lot more than running and socialising in a dogpark. Yes, that’s important too! So, dear Islay, I think this lady could give you some hints and advice. Today is about traveling by metro. I think you call it the subway! Read this carefully, my dear! 1. You may never take the escalator! That’s forbidden and dangerous. If there is no elevator, you take the stairs! 2. Going down the stairs you stay next to your mum, same step! Never pull on the leash or you and mum will fall and roll of the stairs! That is not the target! Nevertheless: be sure not to miss the interesting smells! Train your mum to patiently wait from time to time! 5. When getting out, be patient and let others go out first! 7. Bark or whine when necessary but please don’t overdo it! People will be mad at you! Aire-ladies don’t disturb people! What a surprise! You really did surprise me! This morning the postman brought a package. That’s not unusual these days, with mum’s friends all over the world, these days. But today, the package was adressed to me! To ME! Kita, that was on the box! My mum gave it to me to unpack! Surprises got bigger and bigger! Dear Taffy and Monty, you guys, you know what a lady needs as a diversion in every day life! First of all you completed my ‘farm’. Now I have a cow and a doggie too! My chicken and pig will be happy! But then, you remembered I like to play with empty bottles! But the bottles were very well hidden, you guys have lots of humour, haven’t you! It took me almost 20 minutes to find the bottle that I heard but could not see! Finely I found it and almost unpacked it. Mum filmed it! Thank you so very, very much, you too! Dank je wel! With this I can play for hours, mum says. After an hour she put it away! 😦 She says I can play again tomorrow. Thanks a lot, guys! Unbelievable, incroyable, ongelooflijk, unglaublich, utrolig, 信じられない … You did it! Here in Belgium, at midnight (summertime here), we did not break one record, we broke two! That’s the force of the aire-force, mum says… airedalefriends are very, very special… That’s what she learned in the three years I’m here… me of course, I already knew, i had not to learn that, being an airelady! My dogness, this is an exciting discovery! You won’t believe your eyes reading this! But it is the truth! I did some research… euh, well, euh… the human mum of my mum Funnygirl looked it up for me! What? I tell you! I have family all over the world. Yes I know, the aire-doggies and aire-folks are one big family, they always say so! But I have real relatives all over the world, with the same name! My first name is Kita, but my family name is ‘Van ’t Asbroek’. Well, I found out that other aire-girls and aire-gentlemen called ‘Van ’t Asbroek’ live in different countries. There is my famous price-winning litter-sister Karolle Van ’t Asbroek in France! And there is my mum Funnygirl who lives in the Netherlands now. Look at the pics of Mr. Bean. 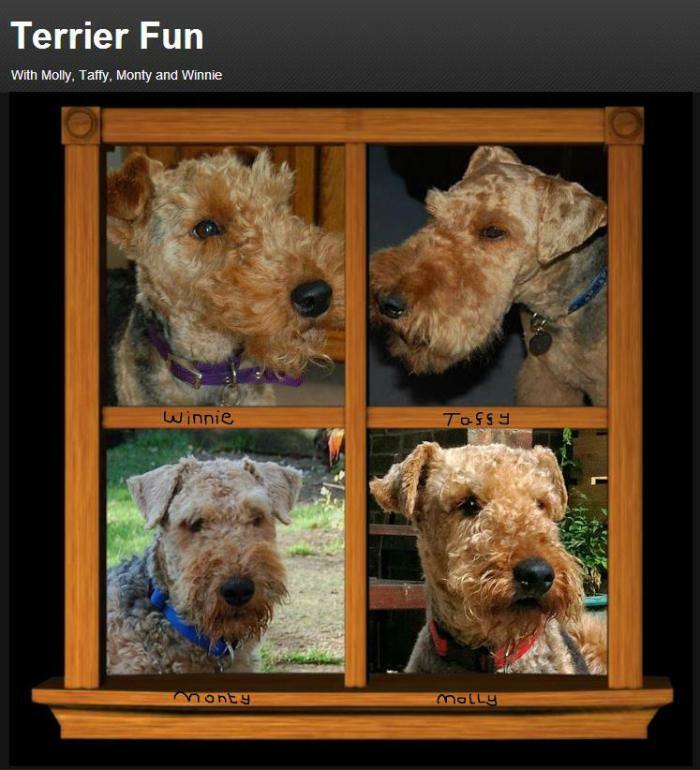 He is a beautiful Van ’t Asbroek-airedale-sir, who went abroad to Norway. You can see we are relatives, can’t you?!!!! He looks a bit like my grandpa Desmond… Well they are both Van ’t Asbroek! Mr. Bean and his Norvegian dad. Oh, he is so handsome, mr. bean! Kita sends Valentine-greetings to… a very special girl! Well then… I will send special greetings today to a very special girl! I’ll explain! There are Sam and Ike in Wyoming and their mum! Wel the Hump Day-mum has a very lovely and special human sister! Why is she so special? She works in a library, just as my mum does! And she is always smiling, she loves the books very much and she reads a lot of books! My mum says this smiling lady may come to Antwerp and make mum’s library a lot brighter and she will make all the visitors smile too! Sam and Ike’s mum did send some pictures of this lovely smiling library-girl! And something else is special! She has airedale-friends! Look! So I send her a very big and special, smiling Kita-aire-hug! Jennye and her human mum and dad and… yes her aire-friend Toby!! Jennye with Max and Lemhi! You want to read about this special library-lady? Just click!